Markets and budgets tend to lean towards stability. But as 2018 died, people who metaphorically put their out-of-office alerts on were jolted away from the TV and egg nog by the most severe market moves of the year, all within a matter of days. Market watchers are still trying to get their bearings on the most recent battles between the US President and the US Fed. The FOMC, despite open criticism from POTUS, completed a 4th rate hike of the Fed funds rate on December 19. This signal usually means “steady as she goes” since the US economy, despite the US stock market, has been moving firmly towards growth. Apparently worried, Treasury Secretary Mnuchin made late December calls to several of the largest US banks to confirm their liquidity. This action left many, including this writer, scratching their heads. Markets nose-dived, as many believed the Secretary was either out of touch, or sitting on explosive news that US citizens had been assured (post-Lehman) would never occur again. Markets are looking for clarification and focus from the US Treasury, the Fed, and POTUS on any potential headwinds. FX valuations are likely to be event vs. data driven in the near term. The US-China trade deal is still very much up for interpretation. As details gradually replace bellicose tweets, markets will be looking for actual concessions from the world’s second largest economy in favor of the US, and for solid mechanisms to ensure a more free-floating exchange rate between the greenback and the renminbi. 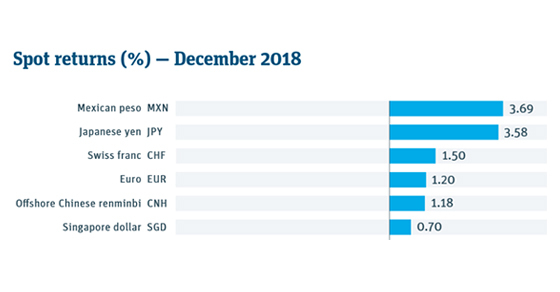 The USD index touched a year-end high vs. a basket of currencies, while the CNY increased in value, albeit slightly, to close the year at 6.8785. Oil’s current price downturn can have major implications on most current economic issues. Major advances in the US and Canadian shale markets weaken the leverage that non-G10 players have used for decades. As the costs of shale refining come down, and geo-political volatility keeps up, the US, its allies, and key trading partners will have more security from which to negotiate with foreign powers. Growth in tech-heavy renewables like solar and wind further amplify this ability. Nations largely exposed to oil price volatility (CAD, MXN, BRL and the Middle Eastern producers) endured some significant year-end currency heartburn, with the loonie in particular weakening past 1.36 to its weakest level since May of 2017. US corporates will start off 2019 largely bullish, as 2018 saw that US GDP and payroll growth largely signaled full steam ahead. However, a full slate of major geo-political opportunities contain both head- and tailwinds. FX volatility spiked more than 10% in December. Responding to pressure from the key constituency that vaulted him into office, Donald Trump opted to shut down the US Federal Government over funding for a border wall. As House Republicans yield their majority to the Democrats in the opening of the new Congressional session, tantrum-style fights may become even more the norm. Brexit continued to garner headlines, but made no progress since UK Prime Minister May pulled a vote at the last minute on her latest version of a divorce agreement to avert an embarrassing loss in Parliament. Her new year message seemed to appeal to the greater British “let’s all pull together” spirit, but given that her most recent round of phone calls to EU members yielded no new concessions from the continent, the March 29 “Hard Brexit” deadline will continue to spur volatile trading sessions.4 To make matters worse, a recent survey found that a full 1/3 of European-based firms plan to cut spending in the UK due to Brexit uncertainty. The UK appears to be shooting itself in the face.5 The GBP continued to weaken into the new year, breaking below 1.26 at present writing. A focus on foreign exchange usually requires proactive efforts to safeguard cross-border business. We can help you add to your success by helping you reduce your currency risks. SVB’s FX team has been ranked by Bloomberg as one of the most accurate FX forecaster in the world. * We leverage unique expertise to provide you with the ideas to help protect your business in turbulent times. Learn How Currency Movements Can Affect Your Global Business. Read how the renminbi may move as market uncertainty rises on a global scale. Subscribe to our Daily FX Updates to have currency news delivered to your inbox. *Bloomberg Q3’ 2018 FX forecasters are ranked based on three criteria: margin of error, timing (for identical forecasts, earlier ones received more credit) and directional accuracy (movements with the currency’s overall direction). The rankings which were based on Bloomberg’s foreign exchange forecasts (FXFC), were for forecasters who provided forecasts for Q3’ 2018 in at least three of the four preceding quarters but no later than one month prior to September 30, 2018. Nate Wyne is the Southern California foreign exchange advisor for Silicon Valley Bank. Nate hold a bachelor’s degree from the University of Utah in International Studies for Business. Nate partners with his clients to create and implement sound risk-management practices around foreign exchange and cash-management. After completing his undergraduate degree, Nate pursued a career in retail banking before moving to commercial and eventually corporate banking. With 13 years of banking experience across the full gamut of advisory roles – Nate enjoys helping growing businesses focus on what they do best.